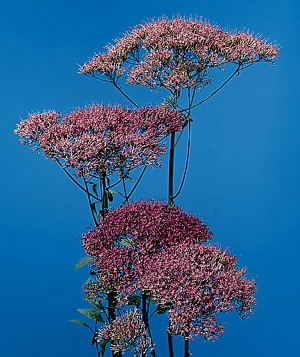 Two main cultivars (‘White Umbrella’ and ‘Purple Umbrella’) were the first to be gown in the US since this crop became somewhat popular in ~1990. Today there are many more cultivars to grow and sell. A good summary of cultivars is presented by Liang and Harbaugh (2001). In short, some cultivars that ranked high include ‘Lake Powell’ (white), ‘Summer Blue Wonder’ (violet-blue) and ‘Lake Superior’ (dark purple). On the other hand, ‘Summer Lake Superior’ and ‘Lake Sunset’ did not perform all that well. Specifically, vaselife in water for the cultivars tested ranged from 7-12 days with ‘White Umbrella’ and ‘Purple Umbrella’ lasting the longest while ‘Summer Lake Superior’ having the shortest vaselife. As a member of the Campanulaceae (bellflower family), common relatives include Adenophora, Campanula and Platycodon. Has tiny flowers with extended styles, in dense, flat-topped clusters at stem ends. Stems leafy, 18-24 inches long. 40F in water for 1 day. Dry storage at 34F for four days in fine but storage at this temperature for one week or more can reduce subsequent vaselife by about one-third. From the Greek “trachelos” (neck), referring to the plant’s ability to heal diseases of the trachea. The specific epithet name “caeruleum” means dark blue, in reference to its flower color.